Rated a Best Value by Princeton Review, the OU MBA is ranked No. 1 in the state by U.S. News & World Report and in the top 25 of public universities across the nation by Bloomberg Businessweek. 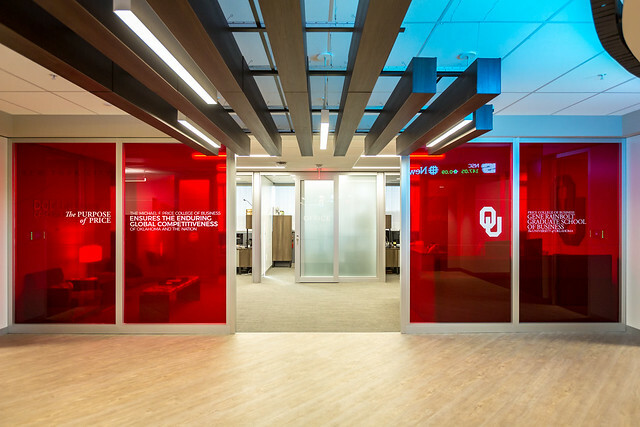 We took Oklahoma's premier Gene Rainbolt Graduate School of Business and moved it to the heart of our state’s capital, where it is strategically located directly between Oklahoma City’s energy and financial services industries and its health care and aerospace sectors. Our students have direct access to real-world mentorship to complement their academic and experiential learning opportunities. They're instructed by OU’s world class faculty, and excel with the additional support of OKC’s business leadership. We've thought of it all with new and redesigned classrooms, a myriad of different sized study rooms (accommodating groups of up to 12 people), and a large student lounge with kitchen and food services. Our students will also have creative interactions whether online or in person, so we have packed our new space with whiteboards and the latest technologies. Topping it off with an onsite fitness center along with attached and covered parking for our students.